Shalom is a stylized star of David, in a variety of patterns that offer wishes of peace and joy. A dotty blue border frames the main star of David and the words inside it. More, solid stars accentuate the style. 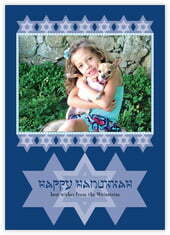 Say Happy Hanukkah simply and beautifully with Shalom style. 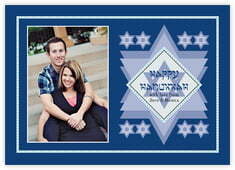 Customize your Shalom cards today!